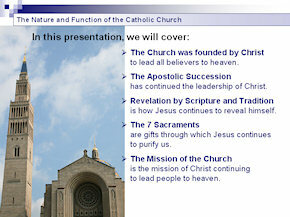 Description: Ideal for early in the Catechumenate Period of RCIA and other faith formation classes, this PowerPoint presentation is an introduction or easy overview of the founding of the Church, the Apostolic Succession, Scripture and Sacred Tradition, the 7 Sacraments, and the Mission of the Catholic Church. It has enough depth to provide good, solid information, yet it’s short enough to be presented in an hour with time for class participation. Comes with a Catechist Guide. 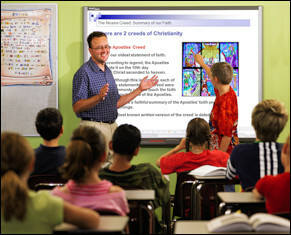 The Church was founded by Christ to lead all believers to heaven. The Apostolic Succession has continued the leadership of Christ. Revelation by Scripture and Tradition is how Jesus continues to reveal himself. The 7 Sacraments are gifts through which Jesus continues to purify us. The Mission of the Church is the mission of Christ continuing to lead people to heaven.